In today’s digital world, passwords play a very important role. In many ways, they are the wall that separates our lives from everyone else. Hacking and malware cases are abundant today which only makes it that much important to guard our passwords efficiently. There are many ways to do that. Two of the most important ways to do so are to have different passwords for different accounts and to create strong passwords that aren’t generic or easy to guess. But this also creates a problem for many as too many passwords often lead to confusion. Making each password tough to guess only adds to that confusion. Luckily we have password managers that are designed to create a solution for this problem. Password Manager by Icecream Apps is one such tool, and you can find our review down below. Icecream Password Manager is a powerful, free yet intuitive software for Windows that helps you easily manage all your multiple passwords and online accounts from one window. This Password manager software can be used to not only store but also manage passwords for a number of purposes such as online bank accounts, website logins, credit cards, identities, etc. It utilizes the AES-256 encryption which helps in securing your sensitive data efficiently. 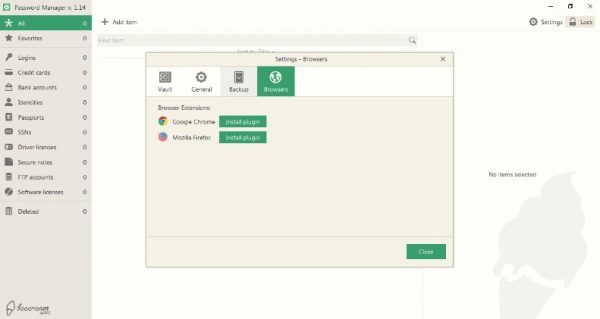 Multiple users can use the Icecream password manager from the same computer due to its vault feature. The vault is essentially the digital equivalent of a real life safe. It is the first line of defense that guards your data. You can have multiple vaults in this tool and then secure them all with one master password. The installation of this software is incredibly simple. With three to four clicks you can get this software up and running. There is no need for endless pop-up clicks or permissions for its installation. The interface of the Icecream password manager is very intuitive and elegant in design. Given below is a walkthrough of the steps you will be taking when using the software for the first time. 1) INITIATION PAGE – Once you have downloaded this software, install it and open in next. You will come across the initiation page which will ask you to create a vault. 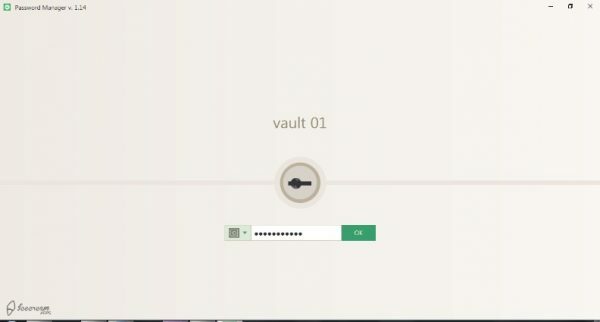 You will need to input the name of your vault (as you can have multiple vaults in this software), password and a hint option in case you forget it. Filling these up will create your very own first vault. Below the hint option, you will also see an “Import” button. If you click on it, you will get a drop down menu asking if you want to import from .ipm files or Dropbox. 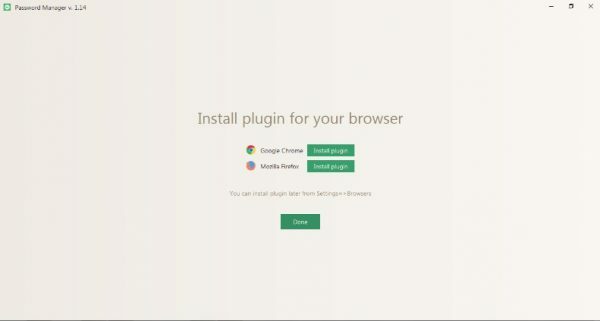 2) INSTALL PLUGIN OPTION – The next page will ask you if you want to install plugins for Chrome or Firefox. 3) YOUR VAULT SCREEN – Following the above step is the Vault home page. Here you simply have to enter the password you created on the first page to enter. Clicking on the safe icon will also allow you to create additional vaults. 4) THE MAIN INTERFACE – Inside the vault, you will see all your options neatly lined up on the left side of your screen. 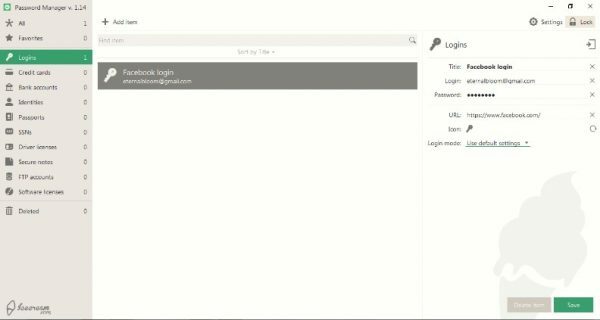 Clicking on the “Add Item” button at the top will allow you to start managing your passwords. For instance, if you want to input your Facebook login details, then simply click on the “Add Item” button and choose “Login”. Then on the right side of your screen, input all the necessary details such as the title, login id, password and the URL of the website where you have the account. In this example, we’re setting up the password management of a Facebook account. 5) SETTINGS – At the top right side of the interface, you will find the “Settings” button which will allow you to customize your password management. The “General” tab allows you to set up the autolock timer and other basic customizations. The “Backup” tab allows you to customize the way you want to back up your data. The “Browsers” tab allows you to go for the Chrome or Firefox plugins. Master Password – Manage all your vaults with a master password for better convenience and usability. Secure Notes – Safeguard your unique ideas using secure notes. Browser Plugins – With this feature, you can get instant access to your important data straight from your favorite browser. Dropbox Sync – An amazing feature that lets you synchronize your data in the cloud if required. Multiple Users – Up to 10 users can utilize this software separately for securing their data. Auto Backup – You can back up your precious data automatically by setting the timer to your requirements. Auto Lock – This function allows you to make your vaults more secure. The password manager software from Icecream Apps is one handy tool to have if you have multiple passwords and online accounts. It is very intuitive to use and does a great job at helping you manage all your passwords. The clear division of different categories ranging from website accounts to passport information and even software licenses is an amazing option to have. As far as cons go, there really isn’t any as the software does exactly what it was intended to do. If I’m nitpicking, I would say that I wished it had more awesome features, but honestly, it’s neither here nor there. If you have trouble managing passwords, definitely give this one a try. Download free Icecream Password Manager from icecreamapps.com. Some of you might want to also check out Icecream eBook Reader, Icecream Slideshow Maker, Icecream PDF Converter, Icecream Image Resizer and Icecream Media Converter from the same developer.